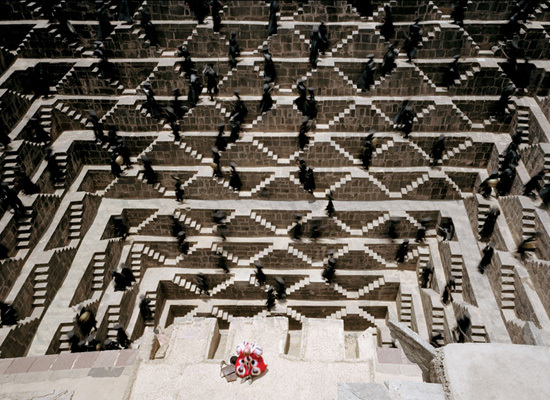 InfraNet Lab continues its unbroken string of phenomenally wonderful posts with a report on stepwells, those “inverted ziggurats excavated from the earth” that were the Subcontinent's answer to the extreme seasonality of its water supply. During the too few monsoon months of hydro-excess, the stepwells would fill up and the collected water would be used for the upcoming drier months. It was only with the British rise to power in India in the early nineteenth century, that opposition to stepwells as key elements of the Indian water system emerged. To the British, stepwells were a sanitary disaster. The installation of rural taps became a top priority of the Raj. Not without reason, the British colonialists feared disease from the mixing of bathing and drinking water; moreover, the stepwells hosted a waterborne parasite, the guinea worm. Meanwhile, one stepwell, the Chand Baori, made a brief appearance here in a post which has been postscripted through the years.